There are twenty one million people in Mumbai and this has created one of the world’s worst areas of pollution. 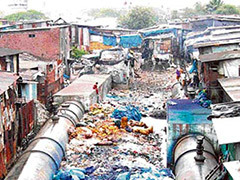 Tight streets are crammed with garbage and the smell of sewage is everywhere. But in Dharavi, 400,000 people are changing the fact that they are one of the largest slums on the globe, into a super hub of recycling. Every day in Dharavi, you see people that were previously unemployed, filtering through the garbage to pull out recyclable items and sell to the companies who will process the recycling. These are then sold to businesses that re-use the plastics, metal and recyclable items into products that are new. Tons of trucks show up every day to the dump at Dharavi, bringing in new shipments of items to be scavenged through, examined and all of the materials that can be recycled, pulled out, sold and reused. Many of the trucks delivering the waste contain items that were previously recycled, used and now thrown away again. The Dharavi area has established themselves as a creative hub to not only rid themselves of the intense trash and waste, but bring employment and enriched lives to many who have been out of work for long periods of time. The recycling efforts of this metropolis has set an example not only for those people in the rest of Mumbai, but also for the world. The eventual goal is to reduce the intense amount of trash and waste and get the program to a controlled point where there will be a continual flow of garbage in- and productive recycling out. As the economy of the area improves, the investment can be made for more improvement into the rest of the pollution problems. The project also brings a heightened awareness to the fact that people can do something productive and profitable about a problem that they created. Posted on July 10th under Pollution Reduction. Desperate times call for desperate measures. It’s the true proof of human ingenuity when we are faced with an almost overwhelming problem and little money, we come up with brilliance. Just goes to show that it doesn’t take a board room full of executives, a thousand meetings and high tech to think of something that can work. We waste a lot of time and effort trying to come up with the best ways to do something and Mumbai figured a way to help themselves and get their community pride back. This would be a great idea for any of the cities in the U.S. I know it would take a lot of coordinating, but these are the kinds of things that can get people to work, get them off of the street and let them have some dignity; while at the same time cleaning everything up. Wouldn’t it be a gas to see this in New York City? If you were ever present when the waste management people went on strike, you would know how quickly the trash piles up. The homeless people that need the most help could be a distinct resource to help things along. Wonder if the Mayor knows about this project?